MYLAPORE TIMES » Gifting Options for this Deepavali. In Mylapore. Gifting Options for this Deepavali. In Mylapore. With Deepavali around the corner, everyone gets busy preparing for the big day. Here are some gift options in the Mylapore area to choose from to delight and surprise your relatives and friends on this festive occasion. INDIAN SWEETS: CK’s Bakery which specialises in cakes and pastries, has launched its line of Indian sweets. 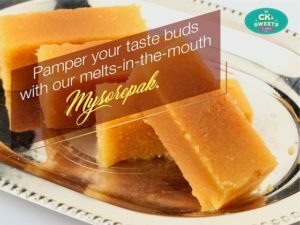 CK’s Sweets offers three varieties of Indian sweets – Kaju Katli, Mysorepak and Motichoor Laddoo made with 100% pure ghee. BAKED GOODIES : The Cupcake Sisters from San Thome can customise baked goodies on pre-booking orders. Minimum order – a dozen. Packed in reusable tin boxes- 2 choco chip cookies at Rs. 100, three Millionaire Shortbreads at Rs. 200, three assorted treats at Rs. 350 and six assorted Brownies at Rs. 400. Ph: 7358371871. HERITAGE RICE AND AGARBATTIS: Pick assorted artisanal organic heritage rice from the store ‘Spirit of the Earth’ and get it box-packed with a note about the rice grains. Comes as single, double or a box of four. Price starts from Rs. 300. Or choose agarbattis wrapped in marbling paper available in sandalwood, jasmine, javathu, thazhampoo fragrances. Priced at Rs.40 per pack. Located at 3rd Floor, Srinidhi Apartments, No 4, Desika Road, Alwarpet. Ph: 9500082142. DRY FRUITS AND NUTS: Dry fruit hampers available in gift packs for Diwali at TRV Nuts & Dry Fruits. The 200gm pack for Rs. 320 includes 50gm of cashew nuts, almonds, pistachio and raisins. The 400gm pack at Rs. 660 includes 100gm of the same. The pack at Rs. 820 includes 100gm of black dates and dried apricot in addition to the four dry fruit and nuts. This store is located at 95, Kutchery Road, Mylapore, Ph: 48592727. TRUFFLES AND BROWNIES: Alwarpet-based Sinful Temptations promoted by Uthara Ravikanth offers carrot and coconut truffle at Rs.50 for a box of two. Brownies / chocolates / fudge options available in boxes of 6, 9, 12, 16 and 18 pieces. Pick up and delivery options available. Call 8939254425. GANESHAS IN GLASS: ‘Lucky Ganeshas’ promoted by Santosh Sivaram offers a range of mini Ganesha idols made of glass. A special offer for Diwali on Ganesha with leaf for Rs. 100. Located at D6, 3rd floor, Vasanth Apartments, 40/75, C.P. Ramasamy Road, Alwarpet. Ph: 8124273454. SWEETS AND SAVOURIES: Wedding catering contractors V. Raju Iyer and Hari Haran are taking orders for laddu, badusha, jangri, Mysurpa, Mohanlal cake, karasev and mixture. Sweets are priced at Rs. 500 onwards per kg and savouries at Rs. 450 per kg. Boxes can be customised and packed. Located at 76/52, Adam Street, Mylapore. Ph: 944434269 / 24934906. This entry was posted on Saturday, November 3rd, 2018 and is filed under Sales, Shopping, Shopping, Stores. You can follow any responses to this entry through the RSS 2.0 feed. You can skip to the end and leave a response. Pinging is currently not allowed.